I started to write this blog post and then decided to check when the last time I blogged any recipes was. It was the 2nd of March. I know. A slow cooker recipe in summer. But you know, Scotland. I've made this a heap of times and as there aren't many ingredients it's really easy to put together. Don't be put off by the lack of ingredients though. This is one tasty dish and can be thrown in the slow cooker before you leave for work. The smell that will greet you when you get home is worth it alone. Pour the sauce into a small saucepan over a medium heat and add the cornflour and water. Stir until thickened. Serve the chicken on a bed of rice with the sauce poured over and some shredded spring onions as a garnish. Voila! I'm not sure that this is a stroganoff. Maybe it's a goulash. I kinda just went with what I had in the cupboard and some leftover beef I had from a Sunday roast. I had no brandy but managed to procure a very old and questionable looking bottle of cooking sherry from the back of the cupboard. It still ended up pretty tasty though so I insist you try it. You will have to excuse my instructions though. And by excuse I mean completely ignore. I made this for one and just guessed at random amounts while throwing stuff in the frying pan. Get home from work and curse the fact you were too lazy to stop at the supermarket on your way home. Randomly gaze at various take away menus before deciding that you cannot justify another take away and thus will just have to cook something. Open the fridge and stare at it for a few minutes. Re-consider pizza. Remember you are going to Cyprus in a few days and need to be in a bikini. Open fridge again. Throw oil, butter, sliced onions, mushrooms and some garlic into a pan and cook until softened. Slice your leftover cooked beef joint into bite sizes pieces. Enough for one. Locate dodgy bottle of cooking sherry and throw in a glug. Try not to lose your eyebrows because this will flambe. Once alcohol has cooked off add your beef, about a teaspoon of dijon mustard and a good sprinkling of smoked paprika and stir. Next add about 100ml of beef stock and allow to cook for 5-10 minutes or so. Add cream or creme fraiche and stir to combine. Switch the heat off. Throw in some parsley if you are middle class and just so happen to have some knocking about the bottom of the fridge. Add some seasoning and a squeeze of lemon if you are feeling exotic. Serve with rice, mash or big chunks of sourdough. Congratulate yourself on not ordering pizza then proceed to demolish a family sized bag of Maltesars in front of Keeping up with the Kardashians. I think this is meant to be a main course but to be honest this is more like a side dish for me. So when I made this dish for Meat Free Monday I accompanied it with my bodyweight in brown rice, a lot of grilled halloumi & lashings of Sriracha. But if you have had an indulgent weekend and want to make yourself feel a little bit better then this recipe from Delicious Magazine is probably the way to go. I know what you're thinking. Warm brussel sprouts in a salad? But trust me when I tell you that this recipe from the How Sweet It Is blog is amazing. 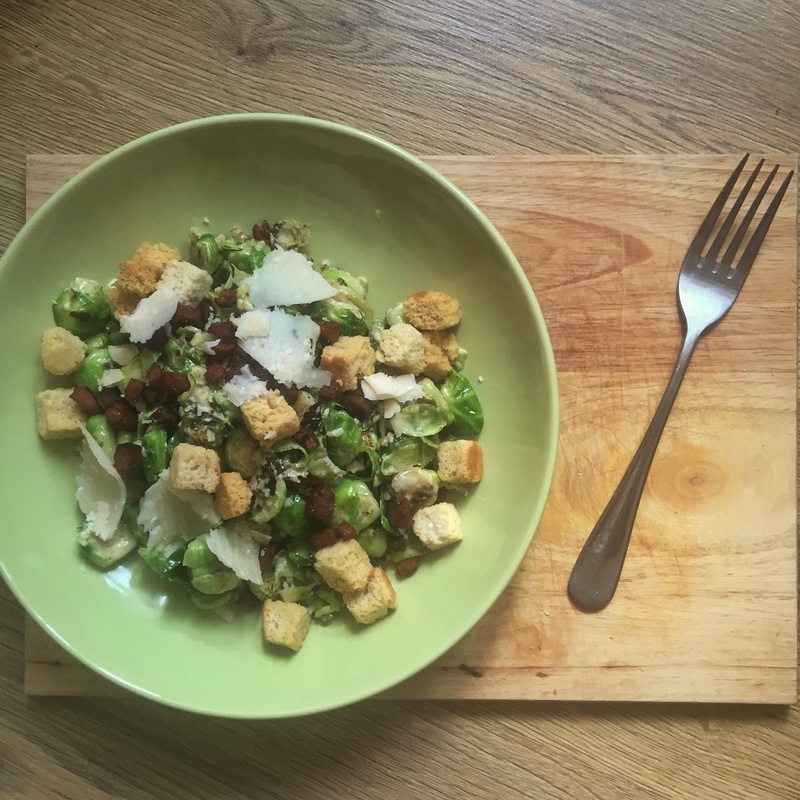 And come on, BACON FAT CIABATTA CROUTONS. What's not to love? One thing that has developed from my recent bout of cooking laziness is that I am now cooking a lot of pasta. One for easiness and two because I've decided that life is too short to not eat pasta just because it's a Tuesday. But I have most definitely saved the best till last with this recipe. I replaced the Ziti with Rigatoni because the Morrison's next to my flat is not that cosmopolitan but apart from that I followed the recipe to the letter and actually let out a weird little noise when I took my first mouthful. It's that good.